December 2nd, 2014LDMT: The drop down tree does not appear on the page, what am I missing? Regarding drop-down menu trees; I just can't get it to show on my pages, neither locally or online. I have not changed the default name or paths in your program and uploaded all files to my web-server. I have compiled my menu to the place that it publishes my site locally in WB9. However, there is not linking code for the tree. 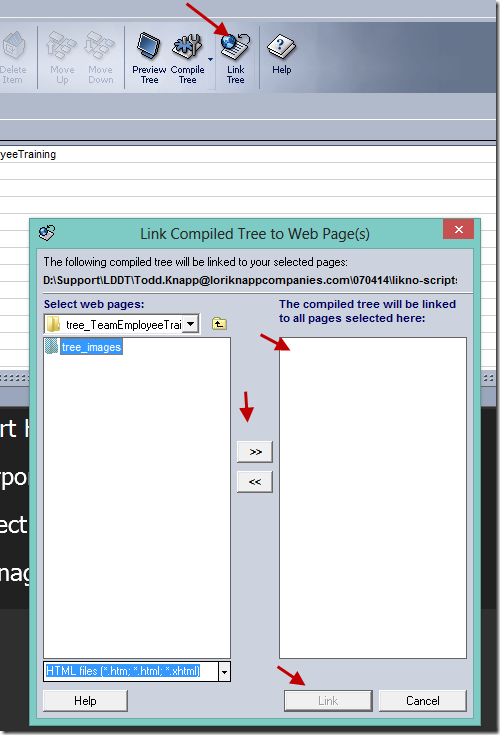 You need to link the tree (after you have compiled it) to the pages you need it to appear. Open the tree project and click Link Tree, on the form that appears choose the pages you want the tree to appear and click the right arrows to transfer them on the right side. Finally click the Link. Alternatively, you may want to manually add the linking code to your pages. That means you need to edit the pages you want the tree to appear and add the following code right after the <body> tag. Where highlighted you need to change that to values according to your project. In case you need help on this, please send me your tree project file so I can give you the exact names. It’s a little embarrassing that I missed that, but now I am a really happy man!!! November 24th, 2014AWM: How can I set a link on a menu item and make the submenu stay highlighted depending on the current page? I using AllWebMenu at our website. I want: when you click my menu to go to new page, I want the submenu to open in this page. In general, when you want a menu item to go to a link on mouse click you can define that link by selecting the item you want and insert the path in the Link property. If you want the submenu item to be open when the new page opens, go to Global Properties -> Show Item or Group on Appear and make the settings that best fit your needs. This way, the menu item will be highlighted according to your settings. November 7th, 2014AWM: Can I set the menu item to link to a DIV? Is it possible to have the menu open the page in a div instead of an iframe or frame? Trying to have a page where the header does not refresh but iframe and frames are limited in expansion etc unlike Divs..please advise. So, clicking on this item, it will move to the beginning of the DIV with the ID you have specified. You may also want to set your menu as a floating menu, so that it stays as sticky on top of the window (or where you place it). 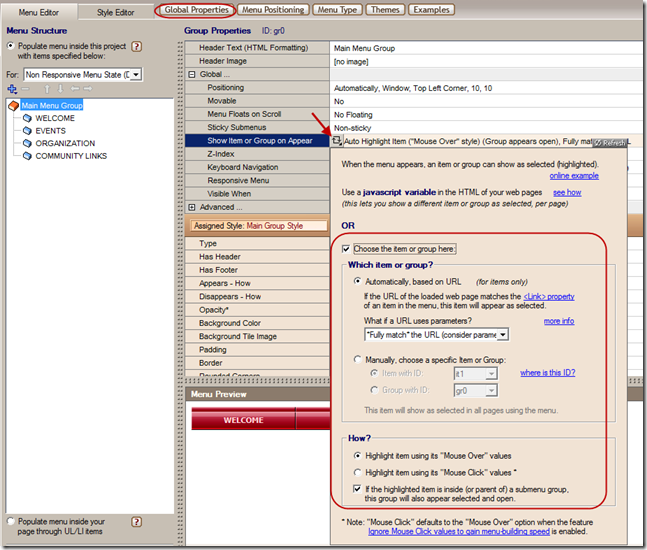 October 28th, 2014AWM: How can I remove the prefix added in link property of the menu items? For some reason it is adding /js/ in front of the links and I can't find the parameter that I must have messed up. 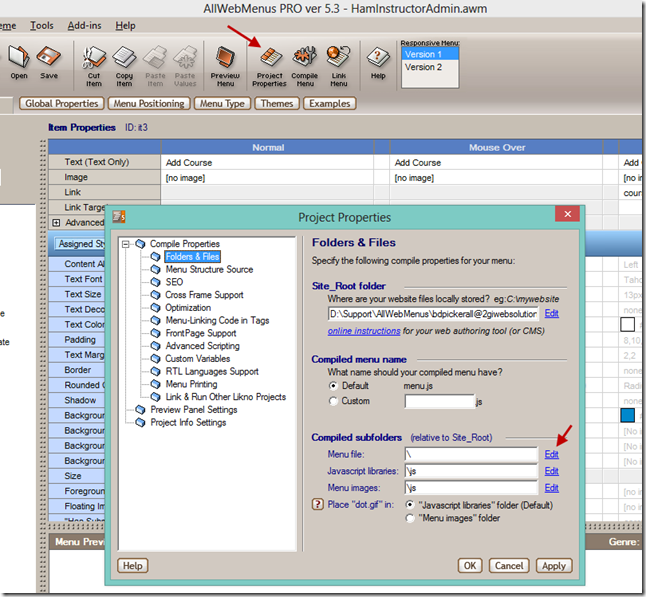 Please, go to Project Properties -> Folders & Files and click on Edit in Menu file. 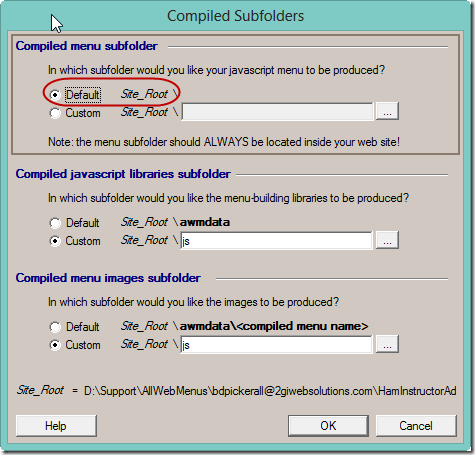 Then, for the Compiled menu subfolder choose the Default (Site_root) and click OK.
Re-compile your menu project and re-link it to your pages. This will remove the js prefix from you links. That happened because you have root relative links on your menu items, thus it adds the js prefix as it was defined as your root for your menu file.